Leaky Woody Dams – what are the differences and what works best? As Slow The Flow Calderdale prepare for various interventions to Slow The Flow at Hardcastle Crags, the question of which type of Leaky Woody Dam (LWD) is coming under consideration. The subject is complicated because we must ensure that the right schemes are put into place in the correct locations. We are learning from the experiences from our colleagues at Stroud and Pickering about the best methods to use and this knowledge and experience is critical to the success of the scheme at Hardcastle Crags. Horse jumps or beaver dams? 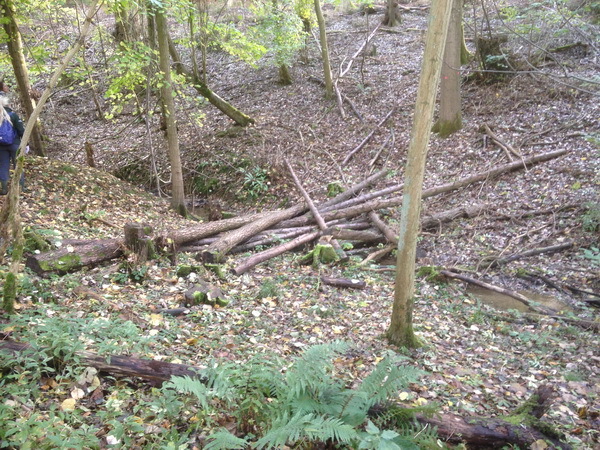 The Leaky Woody Dams used at Pickering are what I term the “horse jump” type in that they resemble the tiers of logs used in horse jumping. They rely on what civil and geotechnical engineers term “passive earth pressure” to keep them insitu. In the case of a retaining wall there are two types of earth pressure operating and keeping the wall in equilibrium. The retained soil which is tending to push the wall over which is termed “active earth pressure” and the soil in front of the wall at the lower level resisting this action which is called “passive earth pressure”. In the horse jump type of LWD the timbers are pushed against the downstream soil by the stream forces and the passive earth pressure resists this action in the same way that the soil in front resists the active earth pressure in a retaining wall. One can argue that these types of LWD’s are not leaky enough and are subject to large forces and several have failed in practice. The Pickering Beck is not as fast flowing as some of our upland rivers in the Calder Valley. This means that our LWD’s if built this way in the larger streams could have much greater hydrodynamic forces on them than those at Pickering and Stroud. There are two forces from the stream flow at work, hydrostatic and hydrodynamic, the former is the force from water at rest (like in a swimming pool) and the second is a function of the velocity of the water which in turn is a function of the gradient and the roughness of the stream bed. 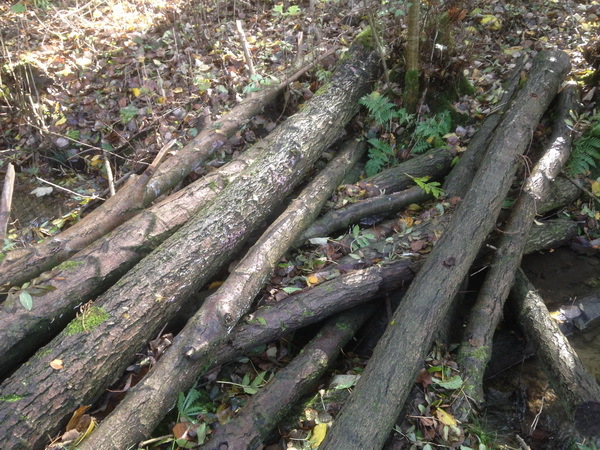 Since our visit to Stroud, we tend to favour the more random placement of logs, rather like a beavers dam than a horse jump. These are leakier and will have lower forces on them. In the Stroud scheme, they pin the logs together with steel pins. They first drill them then drive the pins through into the ground. An improvement on this would be to secure some logs together with threaded dowels, whereby a bar is driven through at least two logs and a plate and washer is installed on each end of the bar clamping them together. 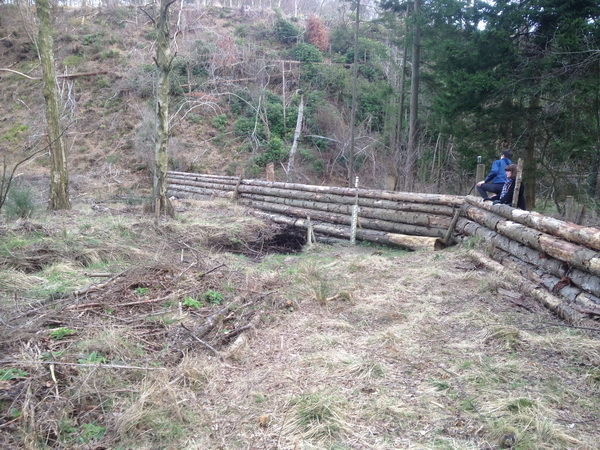 Some designs use steel wire to bind the logs however this will rot through before the logs do. These random types of dam will gather brash over time, this will reduce their leakiness but the brash has a tendency to fail and wash through under high forces so they are self regulating. The horse jump types do not allow brash to “pop” and open up to let water through, particularly if the logs are straight and quite uniform. The other problem with the horse jump type of LWD is digging into the banks which in rock stream beds is not very practical in parts of the Calder Valley. Our upland streams also contain a lot of boulders, these are ideal for securing randomly placed logs because they are themselves fairly randomly placed. Dowels can be used to do this and there are ways of doing this explained in our previous blog HERE. You can use either rotary percussive drills or core barrels all of which can be powered by a small petrol generator. You can use cement grout to secure them or products like Hilti Hit HY 200 ( https://www.hilti.co.uk/anchor-systems/injectable-adhesive-anchors/r4803) which are ready mixed grouts and come in injectable tubes. Boulders can also just be used to act as passive resistance without the need for dowels if circumstances allow. 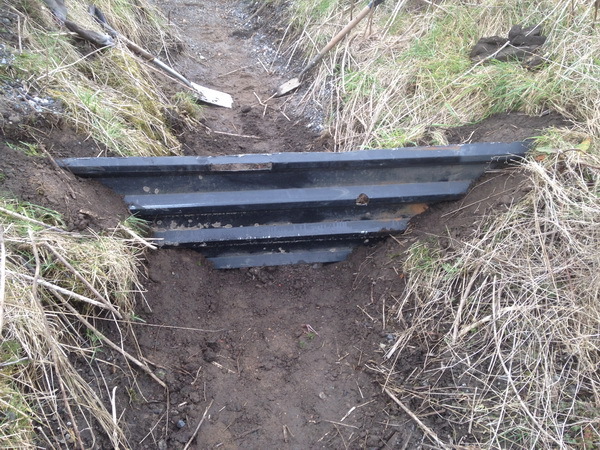 Horses for courses and horse jumps for stream courses too! Having said all this, we do think there is a place for the horse jump type of LWD in parts of the Crags. It is more like a plate weir than an LWD in many ways. 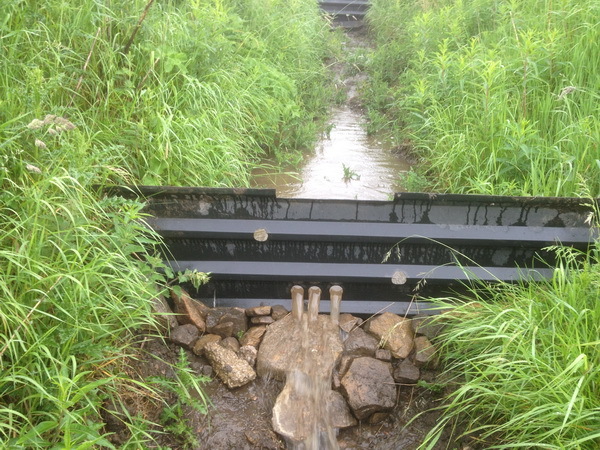 We have found with plate weirs that if you leave a gap at the bottom as shown here, you get a lot of scour in the stream bed. As such, we could use logs in tiers in small incised channels probably a metre or less wide, in this situation you are more likely to find soil banks through which the channel has incised itself. There are many like this in Hardcastle Crags and it is these we will be working on for the early part of this project. The idea is to create small attenuation ponds behind each one and put several in a cascade so that the pond extends as far back as it can without intercepting the next plate weir upstream. If there is a bit of over bank flow well that’s a bonus wetting up the woodland floor in the process, but you are also creating a lot of little ponds and slowing the flow. Silting could be an issue with the traditional horse jump type of dam but with a slot silt only goes as high as the bottom of the slot due to fast flow of water through it which keeps it clear, silting of course reduces the attenuated volume a bit but it doesn’t seem to stop them functioning which is evident from the experimental plate weirs detailed in the blog above and shown in the photographs. In many ways it’s horses for courses and one type of obstruction is fine in one place but unsuitable in another. So we have plenty of options at Hardcastle Crags and around our significant catchment. Some work is already underway by contractors in the Crags, our work in the Crags will start in April with volunteer days on dates to be announced and we will be using a variety of different LWD’s to Slow The Flow. If you would like to be involved, please get in touch with us HERE. 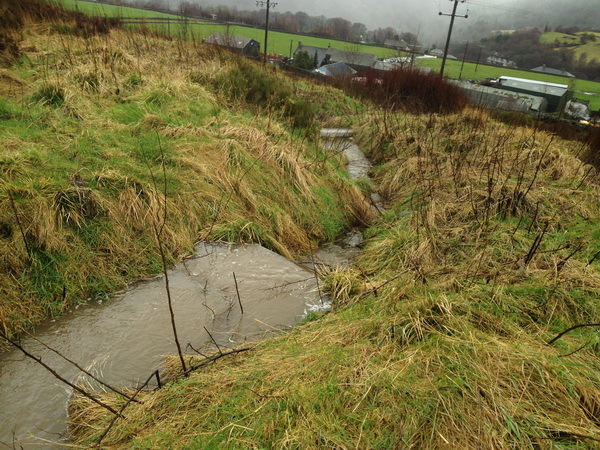 Slow The Flow Calderdale > Blog > News > Leaky Woody Dams – what are the differences and what works best?